Stephen John Fry (born 24 August 1957) is an English actor, screenwriter, author, playwright, journalist, poet, comedian, television presenter and film director, and a director of Norwich City Football Club. He first came to attention in the 1981 Cambridge Footlights Revue presentation “The Cellar Tapes”, which also included Hugh Laurie, Emma Thompson and Tony Slattery. With Hugh Laurie, as the comedy double act Fry and Laurie, he co-wrote and co-starred in A Bit of Fry & Laurie, and the duo also played the title roles in Jeeves and Wooster. As a solo actor, Fry played the lead in the film Wilde, was Melchett in the BBC television series Blackadder, starred as the title character Peter Kingdom in the ITV series Kingdom, and is the host of the quiz show QI. 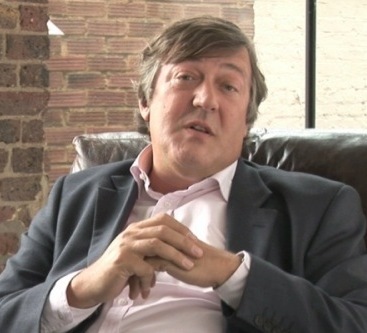 He also presented a 2008 television series Stephen Fry in America, which saw him travelling across all 50 U.S. states in six episodes. Fry has a recurring guest role as Dr. Gordon Wyatt on the Fox crime series Bones. Apart from his work in television, Fry has contributed columns and articles for newspapers and magazines, and has written four novels and two volumes of autobiography, Moab Is My Washpot and The Fry Chronicles. He also appears frequently on BBC Radio 4, starring in the comedy seriesAbsolute Power, being a frequent guest on panel games such as Just a Minute, and acting as chairman for I’m Sorry I Haven’t a Clue, where he was one of a trio of hosts who succeeded the late Humphrey Lyttelton. Fry is also known in the UK for his audiobook recordings, including as reader for all seven Harry Potter novels.